The BJP retained power in Gujarat for the sixth consecutive term by winning the recently-held Assembly polls, Vijay Rupani took oath as the Gujarat Chief Minister in the state capital Gandhinagar on Tuesday, In the presence of Prime Minister Narendra Modi and party chief Amit Shah at the new secretariat. The chief ministers of 19 states where the BJP and 30 union ministers also attended the ceremony. Vijay Rupani holds the CM post for the second time with Nitin Patel as his deputy. CM Rupani with his wife along with 19 other ministers, visited the Akshardham temple immediately after the oath ceremony. PM Narendra Modi said that a win in the elections and being chosen by the state again 22 years of continuously being in power cannot in any way be seen as a setback. 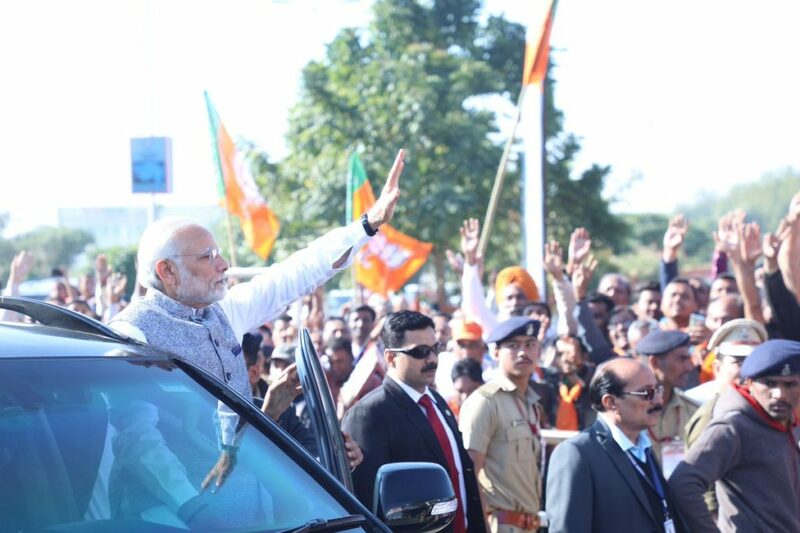 For the 2019 national election for PM Modi seek a second term, to repeat its sweep of the state in 2014, it had won all Gujarat’s 26 parliament seats. This time BJP chosen mix of new ministers, who took oath today are six from north Gujarat, five from central Gujarat, two from south Gujarat and seven from Saurashtra, the region where the BJP lost the most in recent elections. CM Rupani’s new cabinet will have six ministers from Patels and Patidars as well as six ministers from backward castes, three tribals, two Rajputs and a Brahmin, Jain, and Dalit minister each. After the ceremony, CM Rupani will host a lunch for PM Narendra Modi and other VVIP guests at the Mahatma Mandir.